When one is reading a novel, there are a few things that can happen. You can enjoy every word, and look forward to turning every page to find out what happens next. You can also find yourself battling to stay awake long enough to simply get through a story that had so much potential but wound up a disappointment, at least in your mind. 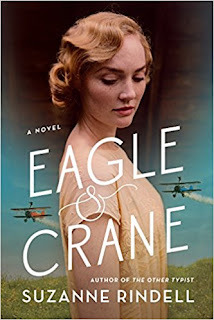 In the past two weeks I've read one of each of these kinds of books, and it is the more enjoyable of the two that will be discussed here: Eagle & Crane by Suzanne Rindell. I stumbled upon this book at my local library as it was yet another new release that caught my eye. At first glance, the cover art would lead one to think this book would be a tale of forbidden love of some sort, as the main focus is on a young woman. But closer inspection allows one to notice the old biplanes on either side of her, and a daredevil on each one. Sure enough, the story promised on the inside book flap was intriguing enough to warrant me borrowing it. Set in World War II-era California, the story follows two families of different backgrounds. One family, the Thorns, descended from an Irish immigrant, Ennis. His disdain for his neighbors, the Yamadas, is over a land dispute. However, it is learned from a flashback portion of the story that the dispute and disdain were borne of his own idiocy. Unfortunately, the hatred he let grow within him was passed down to his next two generations. Kenichi Yamada outlived Ennis, and it if one were to argue that this entire novel is about the world seen in his eyes, that argument would have merit. The families' story is told by following the intersecting lives of Louis Thorn and Haruto "Harry" Yamada, Ennis's grandson and Kenichi's son, respectively. In a way, the feud between the Yamadas (a family of Japanese immigrants and their very American children) and the Thorns could be likened to that of the Hatfields and McCoys. By that, I mean stories take on greater significance and truth the older they become. In time, people just begin to assume that they must hate a certain person or group of people because that is "the way it has always been" yet at the same time, they do not know why. The main plot of the story centered around an investigation into a plane crash. Indeed, one of the planes featured on the cover of the book is destroyed very early in the novel, and there are two bodies on board. A government agent joins the local sheriff's department to help determine the cause of the crash and is met with a somewhat dismissive attitude. After all, the crash happens in 1943, and it is presumed that the bodies on board are of two Japanese men who fled from their barracks at a nearby internment camp. Indeed, due to Executive Order 9066, that time in American history saw the US government set up internment camps for Japanese Americans, many of whom had never been to Japan nor had any family in the country. It was, and remains, one of the several dark chapters in our nation's history. The camps, created in part as a response to the Pearl Harbor attack of 1941, are written about with just enough care and detail to make anyone today cringe at their very existence. Rindell expertly jumps from one time to another, and seemingly at just the right time. As the story in 1943 is developing, important supporting details are revealed through various flashback chapters that tell the respective stories of the Thorn and Yamada families, and how the two young men in each family - Louis and Harry - managed to, at the very least, cordially coexist. For a time, as youngsters before the Thorn family intervened, and during the exciting part of their lives as daredevils "Eagle" and "Crane" in a barnstorming air show, they were even good friends. Their friendship was tested over a young woman - Ava Brooks. It should be noted, though, that as the final act of the book plays out, it is Ava who ultimately is the key to whether their friendship lasts. To say more on this would spoil the ending. The main plot of Eagle & Crane plays out over a few days in 1943 as the FBI agent conducts his investigation into the plane crash. Yet through the flashbacks, we learn why this particular agent actually requested the case. Rindell also manages to weave a handful of other subplots into the story, adding several layers to this beautifully crafted tale. Rindell dropped enough clues and throw-away lines to keep the reader guessing on a few outcomes until the finale of the book unfolded. As it all became clear, I couldn't help but feel like I was watching it play out on screen in similar fashion to The Shawshank Redemption. I won't spoil what was similar and what was not, but I will say, just like in Shawshank, it was a completely satisfying conclusion. In the coming years, it would not shock me if Eagle & Crane were used by high school English teachers and college literature professors looking to challenge their students' ideals and beliefs by using historical fiction to relate to current events. Howie Balaban thinks if Eagle & Crane were to become a movie any time soon, it would absolutely have to feature George Takei.